Although most details are no longer secret, the FCC documents confirm the presence of Bluetooth 5.0, WiFi 802.11 ac, as well as NFC, next to support for wireless bands that allow it to work with all US carriers. However, this handset is expected to sell directly to customers only via Sprint. One of the most interesting flagships to surface in 2017 is Andy Rubin's Essential Phone and, although virtually all of its specs and features have been unveiled already, this handset still has to hit the market. This week, the phone arrived at FCC, on its way to the North American market (Canada included, as we already found out recently). 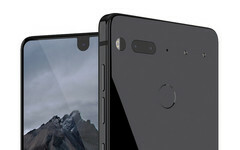 Although the Essential Phone is not very large, it comes with a generous 5.7-inch display that covers most of its front. Its specs include a Qualcomm Snapdragon 835 processor, next to 4 GB RAM, 128 GB internal storage, a 13 MP dual camera setup, an 8 MP selfie shooter, USB Type-C connectivity, all driven by a 3,040 mAh battery. Sadly, there is no 3.5 mm audio jack. The unlocked Essential Phone has a price tag of $699 USD. Sprint still has to announce its pricing. An optional 360-degree camera is the first module to come with this handset and can be pre-ordered for $50 USD next to the phone but should sell for $199 USD alone.